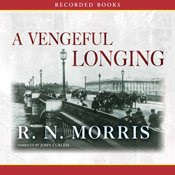 I was asked by facebook friend and audiobook reviewer Sharon Harriott whether there is an audiobook of A Vengeful Longing. The answer is yes! I'm sure he does a great job, though I can't bring myself to listen to the clip on the audible page. Perhaps you will be able to and report back in the comments what it sounds like. Just curious - is it abridged? And if so, how much? Mine was serialised for radio and I couldn't lisen to it because it seemed to use only one sentence per paragraph, cutting out anything that wasn't action and dialogue. Thanks Nik. I'm glad it sounds okay. I still haven't dared. But I might now! Rachael, unabridged, I believe. Getting a radio serialisation is fab - well done. The audiobooks have been sold on by my US publisher, and I have known nothing about them. One sentence per para does sound pretty drastic. And you lose out on all the wonderful atmosphere of Butterflies, I'm sure. But even so - a radio adaptation! I am green with envy.